Um, if you understand current limits and multiple rails, then I don't understand your question. Oh! Maybe I do. Obviously, any company could advertise a feature they don't implement. I don't know enough to know how common that is. And any company that claims to "automatically merge rails when needed" is saying that they "automatically disable the per-rail overcurrent shutdown before it triggers", which is a stupid way if saying "our per-rail overcurrent alarms are disabled", which is most easily implemented by simply omitting them altogether. But ones that have a switch could do something. Whether they do or not is not something I can answer. Ah, once jonny explains it it makes sense. I WAS wondering about whether rails were 'additive' or not. But in sum, it seems as if virtual rails are (in the Epsilon's case) tapped off a 56.666A rail and then have OCP put on it. My next question would be: Why do they 'overspec' OCP on each rail? Why not do the math so that each virtual rail, fully loaded, would match the specs of the single rail? They don't "overspec" it. Again, it's not a designation of capability. What's considered "safe" is 20A, or 240VA. This is the limit the safety spec uses. Usually an 18A rated rail can do 20A peak. They "overspec" the rails to make sure there's almost twice as much power available to the connectors on the rail as the connectors would actually need. If they really DID take the +12V capability and divide it up evenly across the rails, then you REALLY WOULD have "trapped power". That's what makes the PCP&C FUD so laughable. NOBODY evenly divides the +12V into separate rails. Each rail IS "overspec", as you put it, because you do not want "trapped rails". On each rail on +12V we are allowed to draw 18A according to the spec. A theoretical maximum output of 4*18A = 72A (864W). But 864W is more than the PSU's total output of the psu (550W) and even more than the psu's capability on +12V, 41A (492W). 4*18A = 72A only tells us we are allowed to draw maximum of 18A on each of the four rails on +12V, but not on all of the rails at the same time. The maximum we can draw from +12V at the same time is 41A (492W). The gap between the theoretical output on +12V of 72A (864W) and the capability of 41A (492W), is the headroom the spec gives us to use "unused amps" on one rail on +12V, on another rail on +12V. In reality, the gap is bigger, all psu's with a specified maximum output of 18A on the rails, have an OCP which will shut the psu off if the draw from one of the rails on +12V exceeds 20, 22 or even 25A. The OCP's are always programmed to shut the psu off at a higher current than specified on the label, no matter what is printed on the label. Well, actually, the point is that there's some tolerance on the OCP threshold level. The value on the label is a "guaranteed not to shut down" number, while the 20 A limit in the ATX spec is supposed to be the "guaranteed to shut down" number. So they typically design them to 19 A, plus or minus 5%. All this because measuring more exactly than 5% costs more money. It'll shut down somewhere between 18 and 20 A, and not even the manufacturer knows where. So one PSU has dual 12V rails, and another has quad 12V rails. The quad rail model is worse off compared to others because a rail is isolated. It can't provide any more amps than it can generate unless it starts to dip the voltage supplied. I still don't see how it you could potentially trap power though. Even if a rail is OCP'd at, say, 10A or something, if there's no draw from that rail that 10A is still available to other rails, right? So, in sum, it seems as if OCP is meant to prevent nasty things from happening that end up melting stuff in the PSU. The 20A or something in that ballpark limit is meant to stop a bundle of wires on that virtual rail from carrying more than that and causing some sort of catastrophe. Does this make single rails more vulnerable to melting, as OCP or OPP is only applied to a whole rail, and not into smaller bundles of wires? If what I'm typing is what I believe I am typing (late at night, eyes unfocused, tired), then isn't multi-rail an inelegant solution to the true way of being safe: putting a mini OCP on each wire for the max current it can draw? 550W Diet Mt. Dew Drinker! Continental USA, in a desert. The post that prompted this post by jonnyGURU has been snipped by me. The original post was badly formatted, rambling, and severely lacking in structure. A number of people were either confused or angered by it, so I have chosen the most challenging post to use as a response post to attempt to defend the conclusions I have drawn that I attempted (Very badly, it is true) to communicate in the original post. The primary reason I have removed it is simply because it IS extremely confusing, and not at all up to the standards of a post I would like to see submitted to an FAQ thread by anyone - Much less myself. Not a single word in this post should be in any way construed to be sarcastic, because that's simply /not/ my intent in posting it. When I say "Okay", I mean it - There are many things many of you know that I don't. At the same time, I am not completely ignorant, I do know how to read specifications, and while it's very true that some things will confuse me in ways that are probably unexpected to all of you, isn't that true of anybody who is a human? I've also already learned some things from all of this and realizes some of my assumptions were very ill-founded. Anything written by the user whose name equals "Treshix" should be assumed to be a statement of perception and/or of opinion. "Treshix" is not ruler of the universe, known or unknown; neither is he infallible, always correct, a font of true knowledge, expert in knowledge of any subject, or a master of anything except his left foot, the right only being mastered with aid of a titanium rod. It should also be noted that he has chosen to be a Jack of All Trades instead of a master of one, in the theory that having a decent bit of knowledge about many subjects can functionally trump somebody who knows nothing but their own niche specialty. Wow. No offense but you really have no understanding of how this works at all. Even your examples are completely whack. Certainly if you read anything that I put in the first post, you did not understand it. And if you didn't understand it, then I need to work on making it easier to understand. The examples were indeed whack. However, I resent the bald statement that I understood nothing. I don't feel you need to work on making the first post easier to understand. Your technical writing is of very high quality. I believe, instead, I need to work better at explaining what I was trying to say in that post. I'm selecting your response to reply to because it presents the most challenge. I'm thinking more along the lines of "you didn't bother reading the post" because your example is completely whack. CPU, RAM and cards all on +12V1? I even provide examples of how different PSU's with different rail designations are laid out and you pull that random, non-existant example out of thin air? Actually, I pulled it out of experiance. Is it possible I was dealing with a defective PSU? Absolutely. Is it possible that I am simply not understanding a single bit of information, which then skews the entire structure of understanding that gets built on top of it? It would not be the first time it has happened, either. "I don't have to do math?" I don't have to do the math to try and create the information that /should/ have been present on the label? Actually, when I'm troubleshooting what appears to be a power starvation issue that technically shouldn't occur from the information provided on the labels, yes, actually, I probably will feel that I do need to do the math. My point is that a single rail with amps limited to the wattage the PSU is rated to provide, there is a lot less math to do. Same with multi-rail PSU's. It's also worth noting that having all your numbers match logically is not at all required in ATX 2.2 or EPS V2.91 specifications. This is a personal bias. Why are you doing math backwards? And some of the math you ARE doing is complely wrong. Yes, V * A = W, but at the same time W / V = A and that's a more effective way to acheive your goal. How I handle mathematics will vary depending on what I'm trying to show, where I'm trying to get, and my methodology of double-checking something. The thing people have to get into their thick skulls is that the per-rail amperage rating is NOT a rating of capability. It is merely a designation for the limit on any particular +12V rail. You don't add them.... you don't multiply them.... you don't do anything with them. It's just telling you what the current limit is. Nothing more. Any decent PSU is going to tell you the maximum combined +12V rail capability right underneath this and THIS is the number you need to do "your math" with and often times it's no different than any single +12V rail's designation (stated in watts and not amps). Agreed, but I was talking about indecent PSU's. However, I chose to use a decent one as a counter-example to my examples, in an effort to show that A) This is a personal bias and not always accurate, and B) Good PSU's do not suffer from this shortcoming in the same ways. As for having a thick skull, absolutely. However, the same difficulty I encounter when learning new information has on more then one occasion prevented me from learning bad information from people who were respected for being the absolute knowledge on a topic. It has also kept me alive. Any blessing can be regarded as a curse, and any curse can be regarded as a blessing - It depends on your point of view. I very much do at times struggle with what other people master easily, now. Nonetheless, it has created a habit of double-checking myself in as many ways as possible. Even using your HX620 example: Assuming the unit has three 18A rails (which it doesn't) you stated that if you add them up you get 54A, or 648W. Of course, you don't because the actual +12V capability is the number just below this: 600W. This is the information I went off of to try and make my case, albeit badly. The internal wiring was not central to the case I was attempting to make. THIS IS NO DIFFERENT THAN ANY OTHER POWER SUPPLY ON THE MARKET, SINGLE OR MULTI +12V RAIL. Actually, max combined load on 12v: 1080W. Amperage if you add up all the rails? 90A. Snipped here to remove an incorrect statement. Now, this is the kind of label I would LIKE to see - we can see easily the difference between the amperage limit on each rail, the amperage limit on the two pairs of rails, and the overall amperage limit on BOTH rails. Now, you're saying what I'm doing is completely nonsensical, but I fail to understand why. This unit is capable of delivering 1188W on the 12V rails, which considering that both 5V and 3.3V rails are listed in the same 1200W is perfectly sensible. Especially considering that the PSU, according to the sticker, has the capability of putting its full 1200 watts on the 3.3V, 5V, and 12V rails. We have four rails with 18A limits. We have a total combined of 38A. We can fully utilize 2.11 rails. Why do we have four? We definately did not add an extra rail here because we needed it - No, we have four rails simply for the sake of having four rails. If you try and balance between all four rails, you're actually bleeding them dry at 9.5 amps. We have 96A available on all four rails before we hit the limit. We have a total max combined power of 62A. We could toss one of those 30A rails and still have 76A before we hit the limits. We have a 60 second peak limit of 950W on an 850W PSU. Even tossing a 30A rail, we can still hit 912W on the 12V rails alone. The amperage limits are set for a total of 1152 watts according to the sticker. The extra "48W" isn't going to other rails or anything like that. It was never there to begin with! The 18A per rail are not a measure of capability, but a measure of limit. 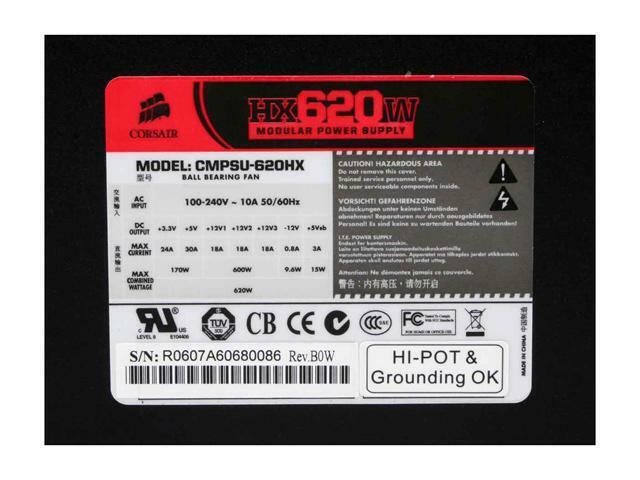 The capability number is the number just below: 600W. And no, the "four missing amps" are not claimed by the -12V and +5VSB. That doesn't make any sense either. This is the same thing you see on virtually ANY power supply. What makes the Corsair any different? Seriously... Go on Newegg and pull up some PSU labels from their photo gallery and try to find some (decent) units that DO NOT show me the total combined capability. Try to find me some that HAVE their +12V rails equal to that capability. Four +12V rails rated @ 18A.... now I'm going to add them up... no... wait... what does that accomplish? Nothing. Just like adding them up on the Corsair. It doesn't do anything because it doesn't mean anything. They're only saying "we divided this +12V rail up into four rails and put an 18A limit on each rail". Nothing more, nothing less. What's the actual +12V capability? 680W? How do we know this? It says it right on the label. I didn't have to add or multiply to get that. It's right there. What is that in amps? It's 680 / 12 = 56.666A, FYI. The problem is, is that there's plenty of PSU's which DON'T give full information. Now, the interesting thing is, the sticker on the OCZ in question does most definitely not match the stickers shown on newegg. I'm going to have the guy snap a photo of it and send it to me; either A) I'm remembering incorrectly - (Very possible), B) I was given bad information and the guy is going to go "Huh, errr" or C) We have a different sticker on this particular OCZ. What happens if we add the +3.3V, +5V and +12V and the -12V and +5VSB? Who cares. Why would you do that? The +3.3V and +5V are a separate rail capable of up to 155W and the +12V is a separate rail capable of 680W. Why would you add them? 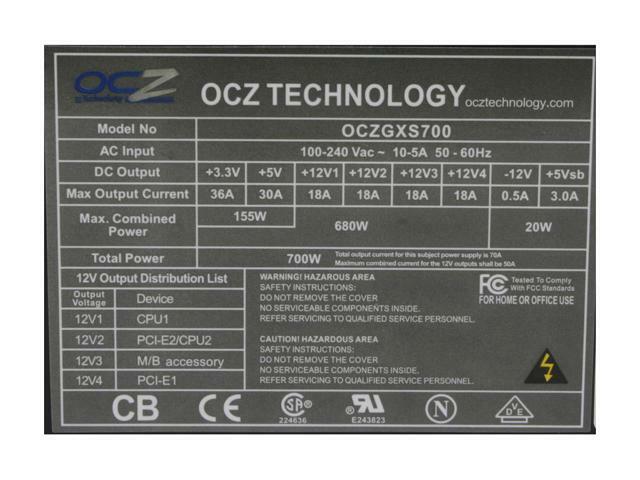 The total capability of the PSU is 700W. THAT is on the label already too. No math to do. The info is right there. The -12V and +5VSB? Those guys have their own value too. They're separate from the other rails as well. The total max capability of the PSU is 620W. Of that, it can do 600W on the +12V. OF THAT, no rail shall put out more than 18A. The PSU can also put out up to 170W on the +3.3V and +5V. That's an "OR" not an "AND" of course because 170W + 600W = 770W. The +5BSB is on it's own independent rail because it needs to provide power even when the other rails are "off". This can do 15W. This is INDEPENDENT of the capability of the other rails. The -12V is 0.8A but whatever, that's a rail that's just regulated with a simple diode. Can I add them? No. Does the addition of ANY of these numbers exceed the capability of the PSU? Yes. Why? Because they are OR values, not AND values and many of the numbers are merely statements of limitation, NOT capability. Then why is total limitation set high enough you could blow the PSU? As far as per-rail load, there's STILL no math to do. There is no "balance" because in this day and age the power supply should have it's connectors split up across rails that are more than capable of delivering power to the connectors attached to them. If you have a PSU that needs to deliver more power to more connectors, you add more rails. So we go from four to five to six +12V rails. You don't throw caution to the wind and go "screw it, I'm just going to go with a single +12V rail because this is getting 'too hard'." I've even noted multiple PSU's which have more connectors then they have any USE for - they're adding more rails BEFORE they have any "need" to - How simply can I say this, if a PSU has five rails at 18A, /many/ people are going to assume, probably incorrectly but they will still do so, that it can provide at least a decent percentage of that 18A on all rails! Not "just 64%!" which is what we see in some of the PSU's above that I have listed as having unneeded rails. "Dance through hoops to make it work"? What? It either works or it doesn't. No dancing and no math. The PCIe connectors are going to be on it's own rail. The CPU's on it's own rail, etc. The way I laid it out in the OP. How would "dancing through hoops" going to change this? Are you planning on opening up the unit and changing where certain connectors are soldered down? Seriously. Per ATX spec version 2.2, the 24pin connector is going to have two 12v pins, but they are both on the 12V1 rail, and it has to supply the power for the SLOTS on the motherboard - of which the PCI-e mobo SLOT is rated to deliver 75W as well! While it may easily be classified as "Unlikely" for the PCI-e card to draw the bulk of it's power from the motherboard and little from the PCI-e connector, assuming that it will be so is taking a risk. The good boards use the CPU 4pin 12V connector, which does not have a required rail, however per the ATX version 2.2 spec, this is to be used for the CPU +12v signal voltage regulators. I find no provision in spec that the PCI-e power on the motherboard slot be provided from an alternate rail. It's entirely possible I'm missing something. Good for you for suggesting the Corsair PSU. It's one of the better units out there for the money for sure. But your reasons for suggesting it are based on complete ignorance. Okay, now that's just plain insulting. Last edited by treshix; 04-01-2008 at 07:30 AM. Oh, I know what I was thinking. I couldn't exactly wrap my head around what I SAID, either, so don't feel bad. I don't think much of anything I said that day actually made a lick of sense. ... Consider this an apology.